If this year’s Reality Tea Readers’ Choice Awards have taught us anything, it’s that if you put Lisa Vanderpump on any reality show, she’s the favorite. At least as far as our readers are concerned. In not so shocking news, Lisa has won our final category of Favorite Real Housewife of 2015. Lisa was up against the other Real Housewives who won their own respective franchise category last week. Bethenny Frankel came in second, followed by Heather Dubrow in third and Kandi Burruss in fourth. Last year’s winner for Favorite Real Housewife of 2014 was also Lisa. Y’all really, really love Lisa Vanderpump! Even when stacked up against other non-Housewife reality stars, she’s your favorite! In our 2nd Annual Readers’ Choice Awards category of FAVORITE REALITY STAR OF 2015, the Real Housewives of Beverly Hills star was the winner by another landslide. Lisa took 33% of the overall votes! Congrats to Lisa, who also won Favorite Vanderpump Rules Star and Favorite Real Housewives of Beverly Hills Star! OK, so THIS will be the last last round of voting in the 2nd Annual Reality Tea Readers’ Choice Awards. The final category for the year is Favorite Reality Star of 2015. This category is comprised of all the winners of this year’s Readers’ Choice Awards. Cast your vote below for the reality star out of this winners group that “won reality TV” in 2015 for you! Voting will remain open until late Sunday night and the winner will be announced on Monday. Now that all of the Readers’ Choice Awards results are in for each city’s Favorite Real Housewives star, we have one last poll for you! 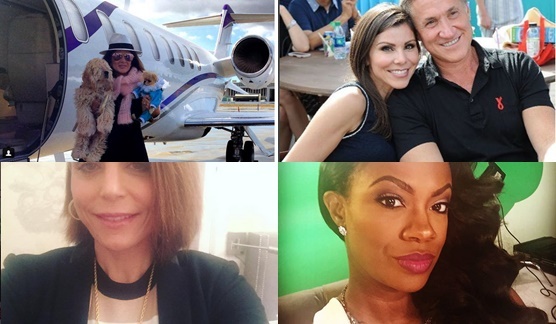 Cast your vote for the Favorite Real Housewife of 2015 – using the winners from each city: Kandi Burruss, Heather Dubrow, Lisa Vanderpump and Bethenny Frankel. Voting will end on Sunday night, January 3rd. We’ll reveal the winner on Monday morning. Last year’s winner was Lisa Vanderpump. This is (almost) it for the final categories of the 2nd Annual Reality Tea Readers’ Choice Awards! We’ll have one final poll for the Favorite Real Housewife coming up tonight based on the winners of each franchise – final results will be revealed for that one on Monday. Last year’s winner was Lisa Vanderpump. But for now, the final categories tonight are: Favorite Comedy Duo/BFFs, Favorite Dancing with the Stars Contestant, Favorite Celebrity Apprentice Contestant and Favorite Competition Show. Runners Up in order of votes: Dr. Terry Dubrow & Dr. Paul Nassif, Ramona Singer & Sonja Morgan, Andy Cohen & Anderson Cooper, Tom Schwartz & Tom Sandoval, JWoww & Snooki, Khloe & Malika. Notable write-in votes: Lisa Vanderpump & Hanky the Swan, Heather Thomson & Carole Radziwill, NeNe & Kim Zolciak. We’re getting down to the final categories in the 2nd Annual Reality Tea Readers’ Choice Awards! Next up we have Most Fashionable, Favorite Sidekick, Real Housewife You Wish Would Return, and Canceled Show You Want To Revive. Last year Jill Zarin took home the award, but this year’s REAL HOUSEWIFE YOU WISH WOULD RETURN is JEANA KEOUGH. Write-in votes: Brandi Glanville, Heather Thomson, Dina Manzo, Camille Grammer, Alexis Bellino, “Stoner Fairy Mom from OC,” NeNe Leakes and Claudia Jordan. Up next we have the winners of Readers’ Choice Awards for Favorite Sister Wives Star, Favorite Southern Charm Star, Favorite Keeping up with the Kardashians Star, and Favorite Little Women: LA Star. Notable write ins: Patricia and “that drunk guy knocking up the cast”.